Who Did Another Triathlon? Oh Yeah That Would Be Me! Two hours and 59 minutes later and I had my second triathlon metal ever! Someone pointed out that this was my second in 35 days. Sounds impressive to me. I have begun the critique and see lots of room for improvement but hey I did it. Who would think that I could keep moving for hours. Did I mention a 15 minute walk to where the competition began and a return walk at the end? So the breakdown was 32 minutes in the water, 1 hr and 24 minutes on the bike (two loops riding a few miles into a killer wind each time) and a 3 mile run (walk for me). Well I quit again yesterday like I had done in August. But this time I’m serious. That was the hardest physical thing I’ve ever done. Hmn a week off and then I begin training again for next year. Even though I’m not doing it again I need to be ready. Just in case. Left to right Roz Kelley, Debra Smith, Terrell Holliman, Maisha Amen and yours truly after we finished. These ladies swim with me and were my inspiration. We range in age from 30’s to 60’s not telling their ages. I’m the oldest just short of my 63rd birthday in October. Iron Girl’s all. Several of my swim buddies and I belong to a group called Triwomen, a group of ladies who volunteer their time and put together a fabulous training season for female triathletes. Every January they bring together a group of girls and women (14 – 70’s) who want to complete sprint triathlons. Now for those of you who have completed an Ironman or two a sprint Triathlon may seem like nothing for me the 62-year-old anti-athlete it’s a big deal. This group has all types of free activities for members of the group (no membership fees) and they pretty much start in January with the goal of having members ready for August (Jersey Girl) and September (Iron Girl) events. They have swim clinics, riding clinics and running clinics. 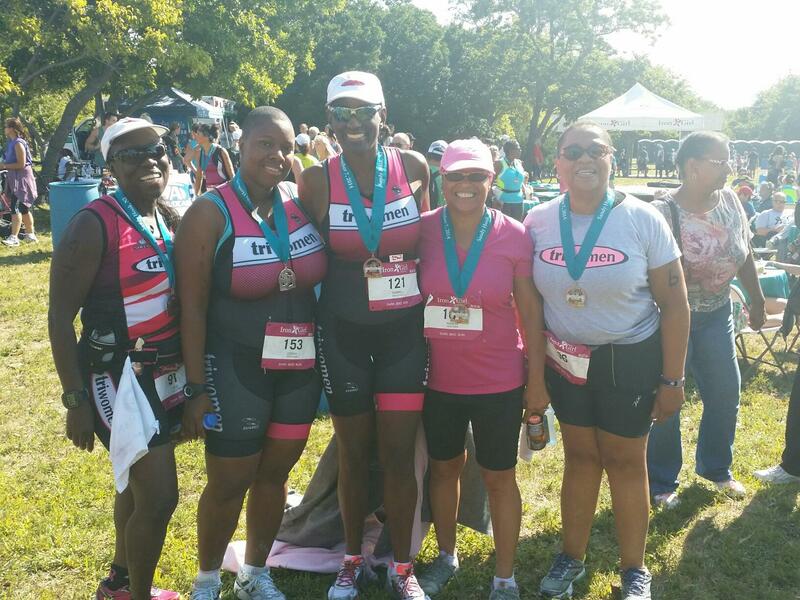 Any money donated to the group or realized from the sale of Triwomen gear is donated to Breast Cancer research. It’s a win win situation! They have taken many women from beginner to triathlete in less than a year and have lots of finishers to show for it. So I’m in. Must overcome fear of the bike! Stay tuned. Tonight I attended a meeting of Triwomen to discuss a training schedule for our upcoming events. I am only concentrating on the Athleta Iron Girl Triathlon in September. I felt a little better after hearing what type of training I should be doing. I am still freaked out about the bike part of the whole thing and fear bike accidents. I will have to get over that but at least I have a plan. I have about two months until I have to start the serious training plans and I am going to use it to get to the baseline I need in each event. Stay tuned.